This was the first year for the Klamath Fishout Formerly known as the Trinity Fishout. I know that some of the people who went on the trip are looking at that ?30 Plus Steelhead Day!!!!!!!!!!? and saying, ?Who is he trying to kid?. We were there and the river was blown out.? I kid you not, but this is how it went. We all drove up on Thursday arriving at various times. It was raining, and people were not optimistic. I had a ten-day weather report with me and the promise of clearing was on the horizon. Friday came and it was still raining. Fishing was not good because the river was pretty bad. We have all fished in the rain, but if the water is dirty it is pretty much all over. Four people went out with the only two guides available and according to Doug (the guide) this was a first that no one caught fish. Some of the wading people, Dave Kruss and Mike McGuire caught some half pounders. Saturday morning arrived and out of the 18 people that came, seven lost the faith that fishing would get better and decided to bale. That left eleven hard-core steelhead fisher people. That Saturday the big clouds went away and the sun peeked out through what was left and the river began it?s clean up. Mary Nishioka, Laure? Ross (Mary?s daughter), Rebecca Blair, and Bill Kulhuisun used the guides and came back with great reports. Bill landed a seven pounder the catch of the day, but all the boats did well. On the banks Oscar Guzman, Dave Kruss, Mike McGuire and I fished the day with some half pound type catches. Dave had a fish on that he fought for 20 minutes and then his ?line?, not leader, broke. 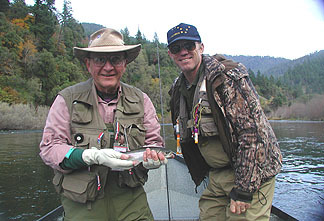 So, the next time you?re on the Klamath and you see this fish, Dave would like to have his line and fly back. 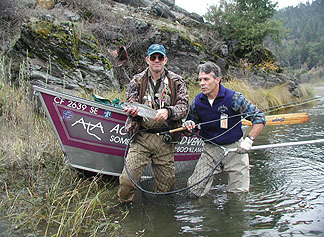 Tom Lamb and Gordon Lilly had the same successful fishing for Saturday. Saturday night barbeque was as good as ever. The Dining hall at the Marble Mountain Ranch is clean, well furnished, and well lighted. It was a perfect place to enjoy conversation and good food. We had much more food than we needed, because all the people that left gave us their part of the potluck. We invited our hosts, Doug, Heidi, and their three teenage children, and we still had food left over. Sunday was the big day. There were just three of us left. Dennis Marquet and I went with the guide in a drift boat. Oscar took my truck and fished from the shore for the day. Put this in your notes for the Klamath: This is the third day no significant rain and this river was clearing so you could now see the bottom in many places. We got a late start, because the guide put our lunches in the wrong truck (which Dennis and I will never let him live that down) but as the sun came out we were on our way. It started slowly as we began the drift and experimented with flies and depths. Then a strike for Mike. Good fish 18"-19". Then Dennis. As the boat drifted back and forth we had numerous strikes. We landed several fish nothing less than 18" were counted. 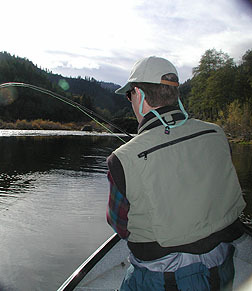 The fly of the day was the old standby Silver Hilton with a floating line with a sink tip. My line was a sinking line with a sink tip, so the depth varied. The juveniles were very pesty and lots of those were released. Then it happened. Dennis in the middle of one of his (many zzzzz stories) was rudely interrupted by his rod becoming "U" shaped and his real headed for the backing. 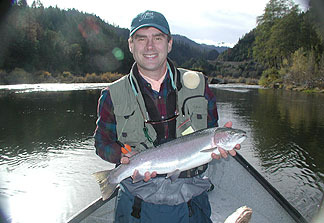 This is Dennis third year of fishing and first steelhead fishout. He jumped to his feet and all he could say for the next 20 minutes was "Oh My God, Oh My God" (that was an improvement to the stories). Doug and I were instructing him in very excited voices over the "Oh My God, Don't let the fish get to the rapids, or you will lose him." After a long bout the fish was in the net. Of course we wanted a good picture, a boat picture. As you can see both guide and fisherman are pleased, I don't know about the fish? This took a while to position for the picture, so the fish was in the net waiting for his debut and the boat and parties to get it all right. Pictures and smile were taken by yours truly; the fish was put back in the water for the next person. You will also notice the Able cap, reel, rod and sticker on the boat. Don't be surprised to see Dennis and Doug on the next Able brochure. 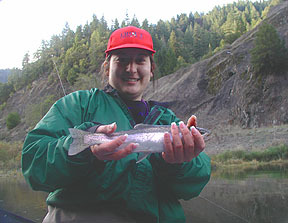 Your first fish like that can be very adrenaline producing. Dennis was shaking for the nest 15 minutes. He finally calmed down and no sooner did the calm settle but my reel was in the backing. This was a strong fish. He came to the surface with an angry leap, and Doug yelled "Oh My God that could be 10 to 12 pounds." This fish was so strong I had trouble bringing him to the boat with my six-weight rod. Like I said, this was a strong and large fish, but I finally got him to the side of the boat and he just held about three feet down. With the six weight and this fish we sat in a stalemate for several minutes. About the time I wanted the checkmate, my rod went straight and my hook was in the air. The three people in the boat in unison said "AHHH". My arm was tired, my pride bruised, but the Silver Hilton was back in the water. My lesson and yours. Big Water, Big Fish, Big Rod. 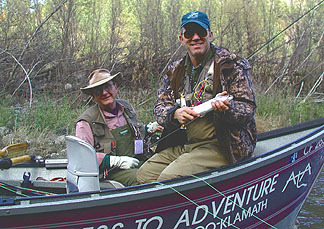 My next fishing trip on the Klamath will be with no less than an eight weight. Next year the fishout will be at the same place on the Klamath but it will be the first weekend of November to catch some better and weather for the fair weather people---- again It will be at the Marble Mountain Ranch. I can't say enough about the accommodations. They are clean, and well kept. Doug and Heidi and their children are delightful, and accommodating. The food is worth the trip. Heidi is a fantastic cook; everything is made from scratch including some of the bread. I recommend the ranch any time and I would always eat my dinners in the lodge. Everyone that stays there does. Doug is one of the best guides I have used and Mary agrees with me. We had a lot of fun and we are looking forward to doing it again next year.